(Vatican Radio) With today’s readings, the Church invites us to reflect on the end of the world, but also on the end of our own lives. 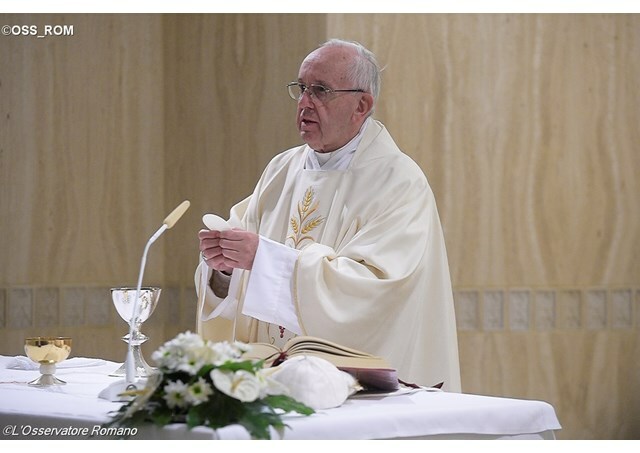 Pope Francis based his homily on the Gospel reading, where the Lord speaks about the daily lives of men and women in the days before the great Flood, or in the days of Lot – they lived normal lives, eating and drinking, doing business, marrying. But the “day of the manifestation of the Lord” came – and things changed. The Church, our Mother, wants us to take time to consider our own death, the Pope said. We are all used to the routine of daily life. We think things will never change. But, Pope Francis continued, the day will come when we will be called by the Lord. For some it will be unexpected; for others it might come after a long illness – but the call will come. And then, the Pope said, there will be another surprise from the Lord: eternal life. This is why the Church asks us to “pause for a moment, take a moment to think about death.” We should not become accustomed to earthly life, as though it were eternity. “A day will come,” the Pope said, echoing the words of Jesus in the Gospel, “when you will be taken away” to go with the Lord. And so it is good to reflect upon the end of our life. Like the doctor, we too, the Pope said, must accompany one another on this journey. We must do everything we can in order to assist the sick; but always looking toward our final destiny, to the day when the Lord will come to take us with Himself to our heavenly home.